"I met him, fifteen years ago. I was told there was nothing left. No reason, no conscience, no understanding; even the most rudimentary sense of life or death, good or evil, right or wrong. I met this six-year-old child, with this blank, pale, emotionless face and, the blackest eyes... the devil's eyes." Speaking of which, Laurie and her friends, Lynda and Annie, manage to be memorable characters in their own right. 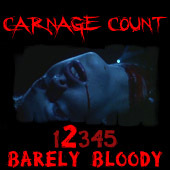 Whereas many later body count films would introduce large ensemble casts to serve fodder, Halloween chooses instead to focus on these three in an effort to further their characterization. While these aren't the deepest characters ever written, they're serviceable enough, as their interactions and dialogue are both extremely natural (no doubt due to the fact that Debra Hill wrote this part of the script). Charles Cyphers also does a good job in the role of Lee Bracket, the somewhat cynical and skeptical sheriff of Haddonfield. Because of the excellent cast, the film doesn't really feel like a body count movie because we don't feel like these characters are just here to die. Furthermore, unlike the countless number of splatter films inspired by this film, Halloween relies more on suspense rather than gore, and Carpenter chooses to unnerve you with his masterful placement of "The Shape" in the frame.